Call 919-808-2918 and tell Two Men and a Mom why you need help with Valentine's Day, for the chance to win dinner reservations at either the Angus Barn, Taverna Agora, Second Empire or Parizade at 7:30pm on Valentine's Day! We'll even give you $100 towards the bill, a free massage or facial from Hand & Stone Massage and Facial Spa, and a Mannheim Steamroller’s classic “Romantic Melodies on CD. Share your story with us for the chance to be a Valentine's Hero vs a zero! Make sure to leave a call back number! 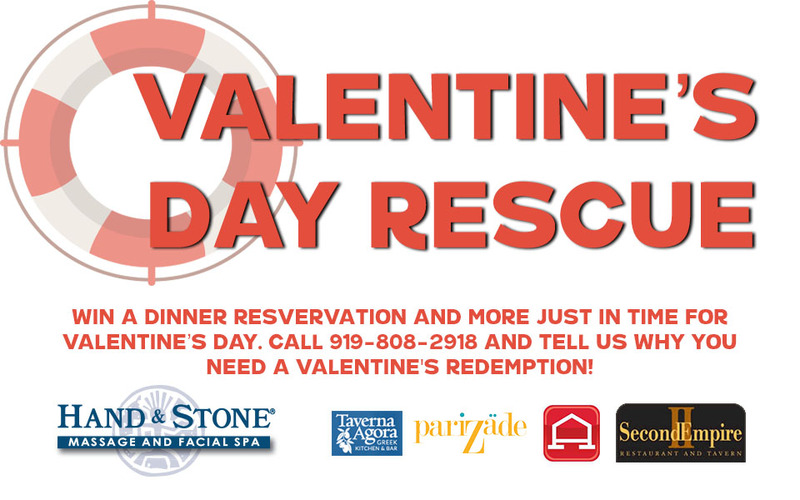 Call 919-808-2918 and tell us why you deserve a Valentine's Day redemption. Ever messed up in the past? Need some help making it up? Leave us a voicemail and tell us! Don't forget to leave a callback number! Enter on our app! Click "Send Shoutout" in the menu options, record your message, and title it "Valentine's Entry." Don't forget that callback number! Enter online with the form below! Prize includes a free massage or facial from Hand & Stone Massage and Facial Spa, a reservation to either the Angus Barn, Parizade, Taverna Agora, or Second Empire, PLUS a Romantic Melodies CD! "Romantic Melodies" explores the feelings of love and the many aspects of this universal theme. Each of the 12 songs featured on this CD are reflective, inspiring, and beautiful. music included on Romantic Melodies. Listen with Two Men and a Mom beginning Monday, February 11th! The Contest shall begin on 02/04/2019 at 5:00 AM ET identified on the Contest Microsite and all entries must be placed and received by 02/13/2019 at 11:00 PM ET specified on the Contest Microsite (the "Submission Period"). To enter the Contest you must click to enter, or if rewards points are required, you must submit the required number of Points specified on the Contest Microsite. The Points will be deducted from your account when you submit your entry. The maximum number of entries allowed for this Contest (and the frequency with which you can enter, if multiple entries are permitted) is specified on the Contest Microsite. (The number of Points required for an entry will be determined separately for each contest, but typically range from 500 to 10,000 Points, and in some contests no Points are required for entry.) An entry will not be valid unless all of the required fields of the online registration form are completed and the information is validated. Once submitted, an entry cannot be deleted, canceled or modified, except by the Sponsor or Service Provider (as defined below). In the event of a dispute as to entries submitted by multiple individuals using the same computer, an entry will be deemed to have been submitted by the authorized registrant of the contest account from which the entry is made. The authorized registrant is deemed to be the natural person who is assigned a username and password to participate in the contest and all decisions regarding the identity of the authorized registrant shall be made by Sponsor in its sole discretion. You may also participate in a Contest through an offline entry. No Points are required for an offline entry. To enter offline, you must mail a 3" x 5" card to our Contest service provider, Enticent ("Service Provider") at: Triton Digital, 1000 Cobb Place Blvd., Suite 407, Kennesaw, GA 30144. You may enter offline as described in the Contest Microsite, but limit one card per outer postmarked envelope. The card must include the following information in legible, hand-printed or typed English: your full legal name, complete home postal address, home telephone number with area code, the user name and email address you entered when you registered for the Service, your age, gender, the entry title, the entry description, a digital copy of the entry itself on CD and the name and URL of this Contest. All offline entries must be received on or before the end of the Submission Period, except that if the Submission Period ends on a Saturday, Sunday or holiday, your offline entries must be received by the immediately following business day. If you are concerned about your mail-in entry being received by the entry deadline, then during the last three business days of the Submission Period you may fax in a photocopy of your offline entry card for the Contest. Limit one card per facsimile. The facsimile must contain a photocopy of the card with the full information listed above and must be received by the end of the Submission Period. After faxing a copy of your entry card, you must still mail in your original entry card for your facsimile entry to be valid. Your original entry card and entry materials must be postmarked prior to the end of the Submission Period and must be received no later than 4 days after the end of the Submission Period. If your original entry is not received by mail within 4 days after the end of the Submission Period, your facsimile entry will be void and you will forfeit any and all interest in the prize(s). Send all facsimiles to (770) 919 2120. Sponsor and its Service Provider are not responsible for any incomplete, late, lost, misappropriated, illegible, damaged, postage-due or misdirected mail-in entries, or for failure to receive online or facsimile entries due to transmission failures or technical failures of any kind, including, without limitation, malfunctioning or unavailability of any network, hardware or software, whether originating with sender or Sponsor or Service Provider. Regardless of entry method, the following are void and ineligible to enter or win: (i) entries submitted by third parties; (ii) mechanically or electronically reproduced entries; or (iii) multiple entries generated by means of software or other automated processes. All entries become the property of Sponsor and Service Provider, and none will be returned. Contests are open to natural persons and legal residents of the United States. You must be at least 13 years of age to enter unless a different age eligibility requirement is specified on the Contest Microsite. You must have a valid street address in the United States (a P.O. Box address will not suffice). Employees or agents of the Sponsor, Service Provider, Enticent, and each of their respective affiliates, subsidiaries, and parent companies and the immediate family members of and persons domiciled with such persons are not eligible to enter or win. Except where prohibited, by entering the Contest, you agree that Sponsor and Service Provider, and their affiliates, advertising/promotion agencies, and prize suppliers, and each such company’s officers, directors, employees, agents, representatives, successors, assigns, and licensees (collectively, the “Releasees”) have the right to publish your entry(ies) on the Contest website and to broadcast, publish, or otherwise use your entry(ies) and/or your name, appearance, voice, biographical information, and likeness in connection with the Contest or for any other commercial, publicity, or promotional purpose, in any manner or medium throughout the world in perpetuity, without limitation, review or approval, or compensation to you. By entering, you grant the Releasees an exclusive, royalty-free and irrevocable license and right to telecast, broadcast, copy, edit, adapt, modify, reproduce, publish, create derivative works of, distribute, use, or otherwise publicly display any or all of your entry(ies), or any portion thereof, in any manner or medium throughout the world in perpetuity, for commercial, publicity, or promotional purposes, and to license others to do so, without limitation, review or approval, or compensation to you. Prizes for this Contest include only those items expressly listed on the Contest Microsite. The Approximate Retail Value of each prize is specified on the Contest Microsite. A Sponsor-selected panel of judges experienced in graphic design will score entrants through a combination of popular vote (40%) and judgment of entry appeal (60%). The entrant(s) with the highest score(s) will be named the potential winners. In the event of a tie, the winner will be the entrant with the higher score for the “entry appeal” factor. All panel decisions are final. AN ENTRANT IS NOT A WINNER OF ANY PRIZE UNLESS AND UNTIL THE POTENTIAL WINNER HAS BEEN VERIFIED BY SPONSOR AND/OR SERVICE PROVIDER, AND SPONSOR AND/OR SERVICE PROVIDER HAS/HAVE NOTIFIED THE POTENTIAL WINNER THAT VERIFICATION IS COMPLETE. All results are unofficial until verified by Sponsor and/or Service Provider. Even if an entry is shown on the Contest website as a leader or winner that entry has not yet won. No substitution of any prizes except by Sponsor. No prize transfer permitted. No prizes will be refunded or exchanged for cash. If a prize is unavailable, Sponsor reserves the sole right to substitute a prize of equal or greater value. All taxes on prizes, and all fees and expenses related to acceptance and use of a prize which are not included on the prize description on the Contest Microsite are the sole responsibility of the winner. As applicable, winner will be issued an IRS Form 1099 based on the prize value determined by Sponsor. Winner(s) may be required to provide their Social Security Numbers to Sponsor for tax reporting purposes. No prizes will be shipped to an address outside the United States. Sponsor will notify a winner using the email address provided with that winner’s entry. Winners may be required to sign and return an Affidavit of Eligibility and Release of Publicity and Liability within 14 days of notification of winning. Failure to sign and return the affidavit and release within such period or to comply with any term or condition of these Official Rules may result in disqualification and forfeiture of any interest in a prize. In the event the winner cannot be reached within 14 days following attempted notification, or if the prize or prize notification is returned as unclaimed or undeliverable, the prize will be forfeited and an alternate winner may be selected based on the entrant with the next highest score. Up to 2 alternate winners may be selected for each prize, after which such prize will remain unawarded. By entering, all entrants release Sponsor, Service Provider, and their respective affiliates, subsidiaries, parent companies, officers, directors, agents, promotional partners and employees from any and all liability with respect to or in any way arising from this Contest and/or acceptance or use or mis-use of any prize, including, but not limited to, liability for personal injury, death, damages, or loss. Sponsor and Service Provider are not responsible for prize quality or utility, and are not responsible for any incorrect or inaccurate information, whether caused by entrants, website users, or by any of the equipment or programming associated with or utilized in the Contest, or by any technical or human error which may occur in the processing of submissions in the Contest. Sponsor and Service Provider assume no responsibility for any error, omission, interruption, deletion, defect, delay in operation or transmission, communications line failure, theft or destruction or unauthorized access to, or alteration of entries. Sponsor and Service Provider are not responsible for any problems or technical malfunction of any telephone network or lines, computer on-line-systems, servers or providers, computer equipment, software, failure of email or players on account of technical problems or traffic congestion on the Internet or at any website or combination thereof, including injury or damage to participants or to any person's computer or data related to or resulting from participating or downloading materials in this Web site or Contest. Sponsor and Service Provider are not responsible for cheating or fraud by any entrants. Any activities intended to disrupt or interfere with the proper play of the Contest, or to defraud the Sponsor or Service Provider in any way may be prosecuted to the fullest extent of the law. Participants engaging in any of the foregoing activities will be disqualified and will forfeit any prizes won. If, for any reason, the Contest is not capable of operating as planned, including, without limitation, as a result of infection by computer virus, bugs, tampering, unauthorized intervention, fraud, technical failures, or any other causes beyond the reasonable control of Sponsor and/or Service Provider which corrupt or affect the administration, security, fairness, integrity or proper conduct of this Contest, Sponsor and/or Service Provider reserve the right at their sole discretion to cancel, terminate, modify or suspend the Contest and award prizes among eligible entries received prior to the termination date. Only the number of prizes stated in these Official Rules and/or the Contest Microsite are available to be won in this Contest. In the event that production, technical, seeding, programming, or any other reasons cause more than the stated number of prizes to be available and/or claimed, Sponsor and/or Service Provider reserve the right to award only the stated number of prizes based upon the entries that received the highest scores. As a condition of participating in this Contest, participant agrees to be bound by these Official Rules and that any and all disputes which cannot be resolved between the parties, and any causes of action arising out of or connected with the Contest, shall be resolved individually, without resort to any form of class action. Participants consent to the exclusive jurisdiction of the courts located in Cobb County, Georgia, and agree that all matters pertaining to these Official Rules and disputes arising hereunder shall be governed by and interpreted in accordance with the laws of the State of Georgia, without regard to any conflicts or choice of law rules or provisions (whether of Georgia or any other jurisdiction). Further, in any such dispute, under no circumstances will participant be permitted to obtain awards for, and participant hereby waives all rights to claim, punitive, incidental or consequential damages, including attorneys' fees, other than participant's actual out-of-pocket expenses (i.e., his or her costs associated with entering this Contest), and participant further waives all rights to have damages multiplied or increased. The invalidity or unenforceability of any provision of these Official Rules shall not affect the validity or enforceability of any other provision. In the event that any provision of these Official Rules is found to be invalid or unenforceable, these Official Rules shall be construed in accordance with their terms as if the invalid or unenforceable provision was not contained therein. For a Winner's List, available thirty (30) days following the end of the Contest, send a self-addressed, stamped envelope to: [Insert contest name], Triton Digital Contest Winner's List, 1000 Cobb Place Blvd., Suite 407, Kennesaw, GA 30144. VT residents may omit return postage for winners list requests. This Contest is operated by the Sponsor. To contact the Sponsor, write to Service Provider, c/o Enticent, 1000 Cobb Place Blvd., Suite 407, Kennesaw, GA 30144. Sponsor and Service Provider are not responsible for typographical, printing, or other errors in these Official Rules or in other materials relating to the Contest.